So obviously everyone will mention the lack of skirts... that aside... why the heck do the rear wheels look like 14s and the fronts look like 18s? I applaud their efforts to make market penetration a priority over ultimate efficiency. Getting 200,000 people to save 10gallons is better than getting 20,000 people to save 20 gallons. They kept it "conventional" and lowballed the hybrid price point. The first thing that came to mind when I saw the picture of the new Honda Insight, "wow, they made a carbon-copy of the Prius. :mad:" This is nothing new folks. We all know that the Prius (gen 2) and older Insight were revolutionary in mass production car aerodynamics, and for good reason. 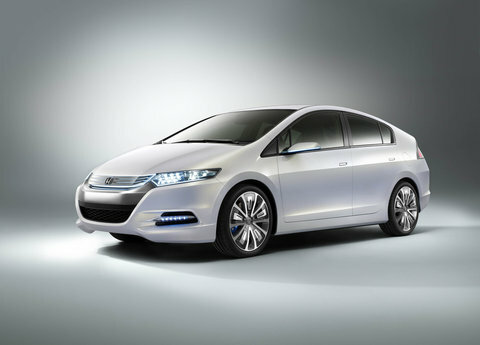 For Honda to make a car that I could mistake for a Prius just by taking my glasses off is in very poor taste. I am not bashing all Hondas or any owners, but for Christ's sake, be a little bit more original. That's my rant, asside from the similarities in shape, I laud Honda for attemting to make a more affordable Hybrid vehicle, Kudos! The wheels look different sizes because of "perspective". You are not looking at a photograph either, but a CGI image. What did you expect the car to look like any ways? There are only so many ways to squeeze 5 people into a box that passes all the safety regulations. And marketing told them that Americans like their hybrids to look different, not just a variant of an existing model. As far as "lowballing" the price, I think Honda expects to MAKE money off this unit. This isn't a market experiment like the original Insight, this is Honda's strike directly at Toyota. Look at the line along the side of the car. I assumed that line was horizontal like on all cars. The line starts barely above the front wheel and FAR above the rear wheel. looks like a prius copy, as others have said above. the original insight was something different, but i agree, honda needs to get some originality. I mistake the new accord for a mercedes all the time. thats not right. other than the look it seems like a wonderful example of a future vehicle. You've got a point. Everything looked fine to me until I looked at the line you pointed out. Hopefully it's just a mistake in the rendering, otherwise it'll be a really funny looking car. I made every line horizontal, which is *wrong* for perspective. But, I think the error you are seeing is way off. The rear tire is definitely smaller. I am guessing this is by design. Why? Because a smaller tire probably means smaller aero-drag + better LRR + increased interior volume. I can see some people hating it from the perspective of a "balanced design" (which could hurt sales), but I think it's kinda cool. Seems like something we would try to do. I like it more than the 2nd-Gen Prius. You'll see the production model come out with front tires 2" smaller... prototypes always show up with HUGE rims and sell with regular sized ones.